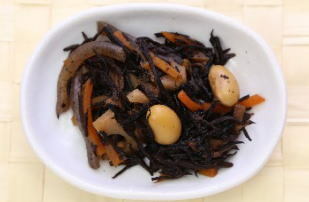 Hijiki no Nimono ('ひじきの煮物', is classified into appetizer), is known as Simmered Hijiki Seaweed in English, and 煮羊栖菜 (Zhǔ yáng qī cài) in Chinese. It is the washoku. Hizhiki no Nikomi, Stewed Hijiki Seaweed. Soybean, Hijiki Seaweed, Konjac, Carrot, Sugar, Soy Sauce, Deep-fried Tofu. Vinegar, Sake , Mirin .